I was just lamenting to nobody in particular how perpetual ignorance seems to enjoy haunting my mind. On the other hand, that would somehow unlock several doors at the same time and turn almost any situation around to my utmost advantage. In this case, it is the overdue yet timely appreciation of a giant octopus in academic garb and its peculiar connection with 30 junior high school students. Yeah, you read that right. Never in my mind I have ever imagined that I would take a fancy to an octopus that doesn't become the stuffing for takoyaki. Hmm...it doesn't look appetising enough anyway. 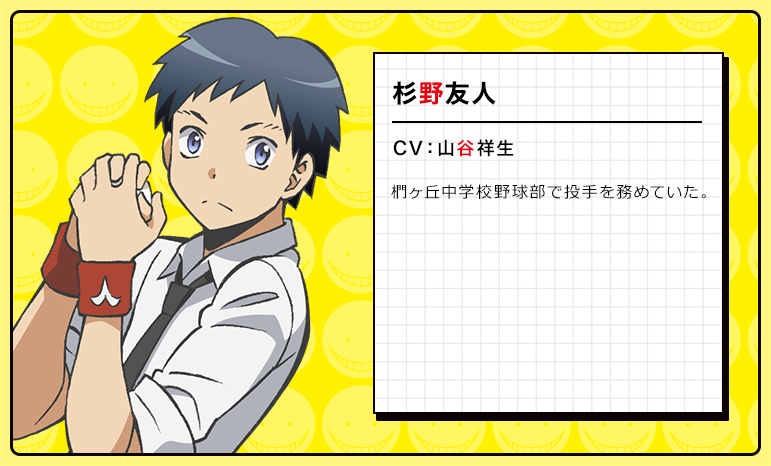 Welcome to 'Ansatsu Kyoushitsu' or 'Assassination Classroom' in English! Buckle your seatbelts. The anime adaptation premiered on January 9th (Fuji TV) and is expected to run for 22 episodes. 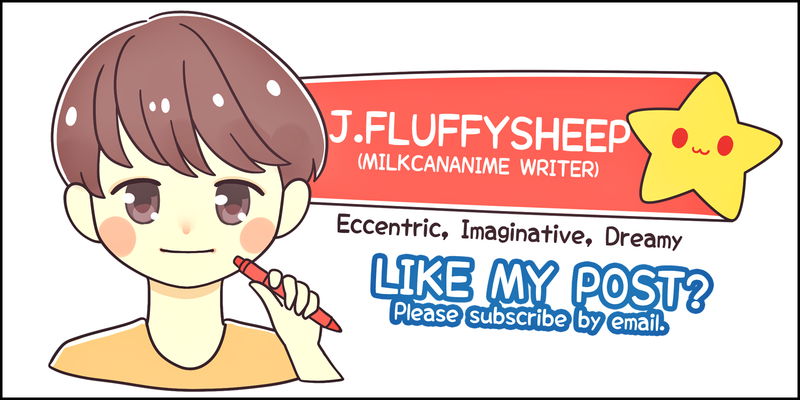 The manga series is created by mangaka Matsui Yuusei, and to date twelve volumes have been published by Shueisha. I would like to focus on the anime for this write-up. No worries though, I'm also madly in love with the manga. As mentioned earlier, there is a giant octopus that looms over a bunch of junior high school students consisting of misfits, delinquents, and more importantly the academically weak. The octopus acts as their homeroom teacher, and that couldn't be more intriguing. Behind its perpetual smug lies a deadly intent to destroy Earth which beseeches immediate action...well, kind of. The government's failed attempts at assassinating the octopus have pushed the red button in the form of those students. Like how undercovers perform their tasks, the students of Class 3-E have a mission that is unknown outside their circle. Within a deadline of one year, they have to use all means to assassinate the octopus while still functioning as ordinary students. As a reward, an eye-popping sum of 10 billion yen would be given to the successful person. 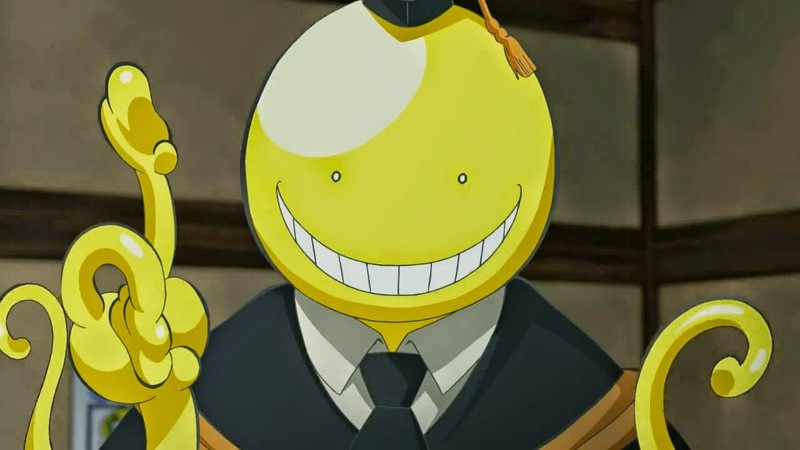 Meanwhile, the octopus later known as Koro-sensei would impart everyday knowledge and such to prepare the students. It has also promised not to lay a finger on any student...yet. 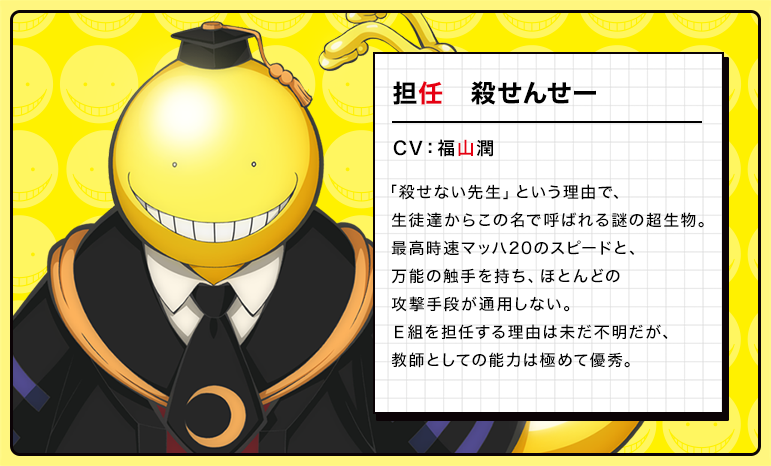 Keeping a close watch on Koro-sensei is Karasuma Tadaomi, who works in the Ministry of Defence and later as the students' Physical Education teacher. He equips the students with know-how in offence and defence. 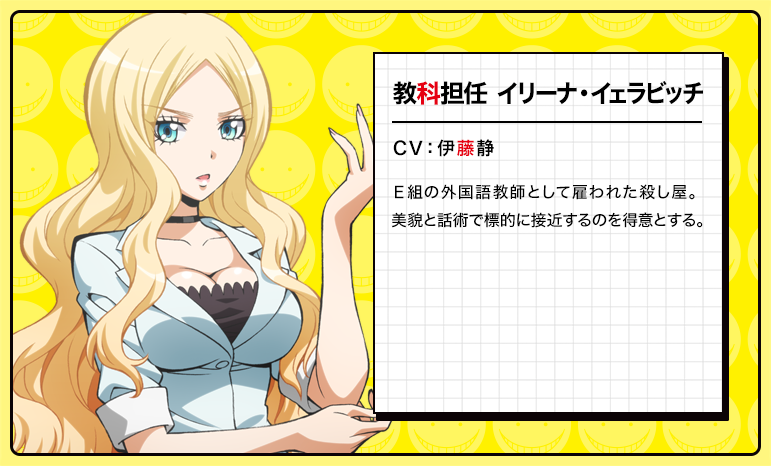 Karasuma is joined by Irina Jelavic, a professional assassin from abroad who had initially shown no regard for the students, and only intent on finishing the octopus quickly. She becomes the students' foreign language teacher grudgingly but her attitude takes a turn for the better (?) over time. Since it would be impractical to write on the entire class, I shall pick the more prominent characters out of the many. First in line is Shiota Nagisa, a petite blue-haired boy who underneath his stature hides a deadly gift which complements his potential as an assassin. Nagisa acts as the series' narrator. 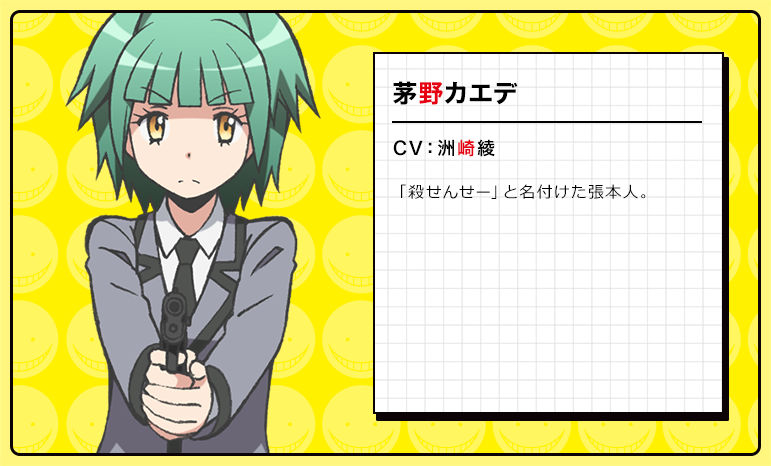 Nagisa's close friend is Kayano Kaede, who gave Koro-sensei its name after an incident during poetry class. Overall, she is a cheerful person yet there is an extremely sensitive side of her as well, concerning...erm, physical assets. Kaede has green hair that is done up in twintails. She looks really compatible with Nagisa, doesn't she? 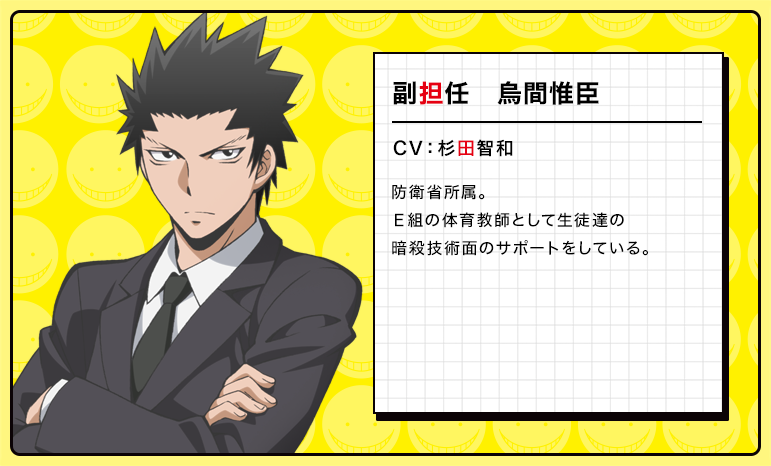 Another close friend of Nagisa's is Sugino Tomohito, a gifted baseball player who has been kicked out of the school's baseball club due to his assignment to Class 3-E. Over time, Tomohito refines his techniques and becomes more confident particularly towards using what he has learnt to assassinate Koro-sensei. 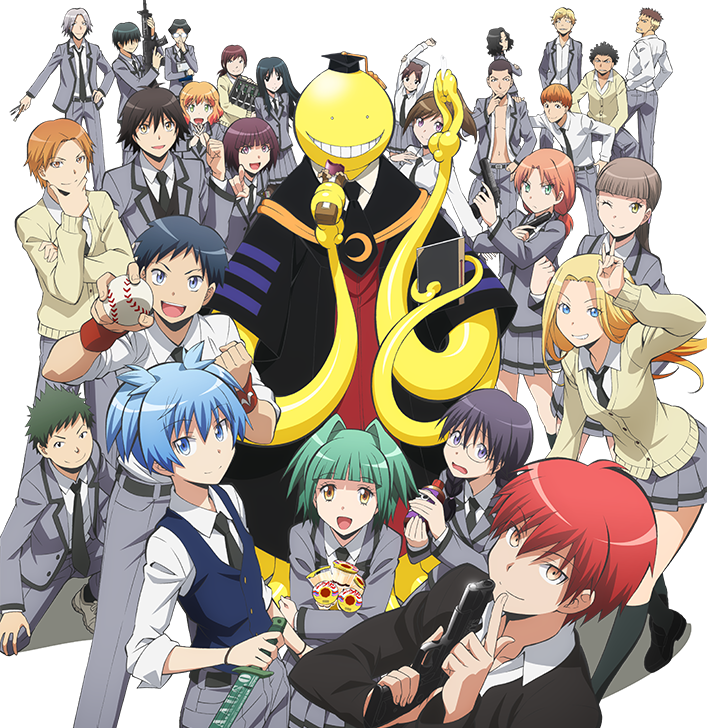 I can't believe that I'd almost ignored 'Assassination Classroom'. I mean, I was already in stitches while watching the opening credits! By the way, the franchise is labelled as a black comedy. Those easily squeamish can relax since there is a complete lack of blood and gore. Nope, the tentacles only squirt very briefly some harmless looking goo. Gosh, I'm so lapping up this series! I can't wait for the full version of the opening theme song! 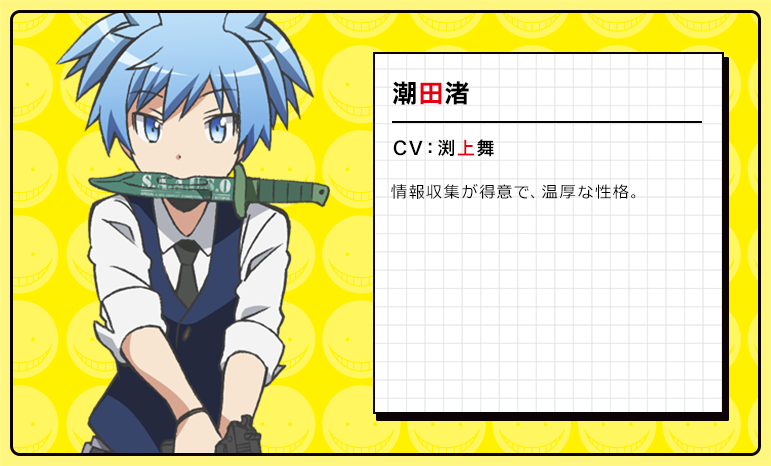 No Comment to " Assassination Classroom "